Isaac and I are walking to school on a spring morning that’s warm on the inside and cool on the outside, on a morning that makes you shiver. The day will warm up, the year will warm up, but it’s all on the edge right now. He’s got one finger hovering softly on my spine just between my shoulder blades as we walk along, which is a thing that he does lately that pretty much knocks me out with the sweetness of it. I wasn’t, I swear, but I was laughing so hard I might have missed the crux of the problem. I said maybe they could work together to make something out of fire. Well! They do this a lot. They make up worlds, and those worlds have rules, and those rules are constantly shifting. Their place in the world changes with the rules, as do their powers and abilities, their actions and their fates. Usually it’s Malcolm, with his older-brother-power, making up most of the rules, which means his character has more power and “wins.” But Isaac can hold his own, he’s got a fierce imagination too. Or he can just stop playing. I’ve been thinking that this is not something we outgrow, though the older we get the less fun and funny it is. It’s still people with more power making all the rules and telling us that our actions are useless and our abilities are worthless. Telling us that we’re powerless against their fire. And that’s when we summon our fierce imaginations and change the rules so that it works out better for everyone. Or we just stop playing their game. Pizza with french lentils, grille mushrooms and roasted potatoes. This pizza was a good way to use up some leftovers. Leftover french lentils, leftover roast potatoes, leftover grilled mushrooms. But it was also delicious! Smoky from the pine nuts and grilled mushrooms, earthy and sweet from the lentils. Nicely crispy and soft. Here’s You Can Never Hold Back Spring by Tom Waits, because I love it. In a food processor, combine most of the pine nuts (but set aside a few small handfuls), the eggs, 1 cup of mozzarella, the milk, herbs, paprika and garlic. Process until mostly smooth. I used small thin potatoes and cut them into slivers about 1/4 inch thick. I had maybe 1 1/2 cups. If you use larger potatoes you can cut them into slices or cubes of about this size. Toss with enough olive oil to coat lightly but evenly. Spread in a single layer on a baking sheet and pop in the oven with the mushrooms. Cook, stirring often, until browned and crispy, maybe 20 – 25 minutes, depending on the size of your potatoes. Preheat the oven to 450. Lightly coat two large baking sheets or pizza pans with olive oil. Spread the dough on sheets, spreading it with your palms and fingers till it’s quite thin, and building up a crust on the edges. I like thin crusts, so mine are nearly transparent at this stage, though they’ll rise a bit as they’re cooking. Prebake the crusts for about five minutes till they just lose their shine. I always top one crust with tomato sauce and mozzarella. 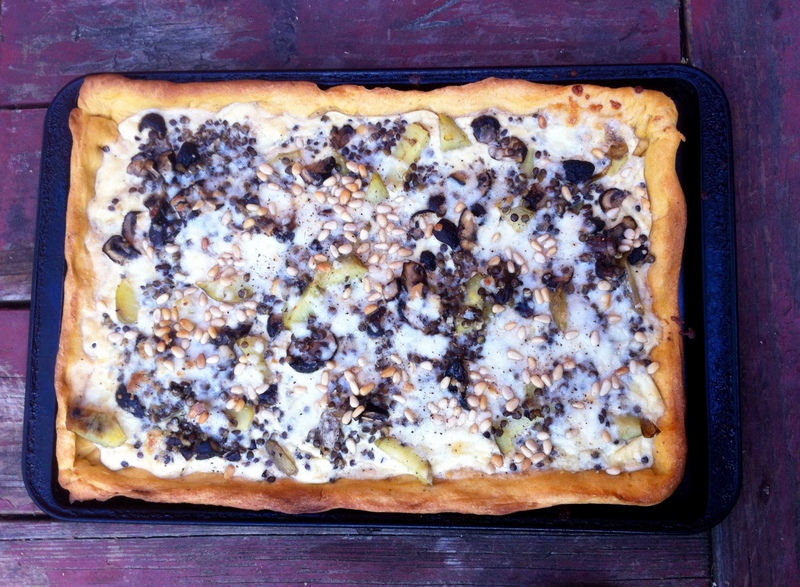 And the other…Pour the pine nut mixture into the crust. Scatter the mushrooms, lentils and potatoes over the top of that, then scatter mozzarella over that, then scatter a small handful of pine nuts over that. Grind lots of pepper on. Bake for about fifteen minutes until it’s puffed golden and bubbly. Keep an eye on it, though, at this temperature it can burn very quickly! 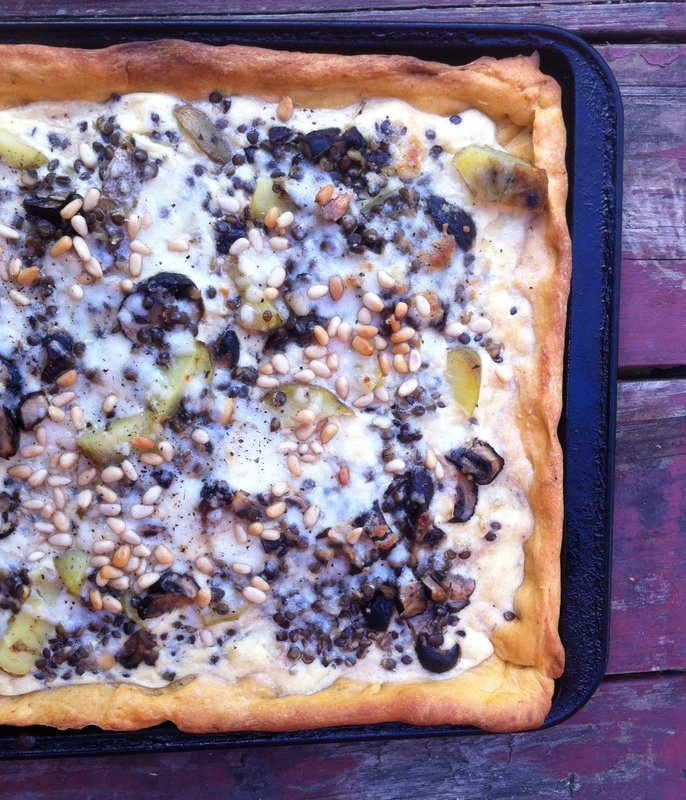 This entry was posted in crust, lentil, mushrooms, pie, recipe, yeasted crust and tagged leftover grilled vegetables, leftover roast potatoes, pine nut pizza, pizza, smoked mozzarella by Claire. Bookmark the permalink. Enjoyed this post and that recipe sounds great for cooler days. The not-playing option is surprisingly powerful! It still makes Malcolm crazy when Isaac won’t play with him. They usually work it out in the end, though. Called the principle of least interest if I remember.